Biology can be inspirational. The spiral ramps in multistory parking garages, the way they are stacked and connecting parallel levels, are replications of helical structures found in a ubiquitous membrane structure in the cells of the body - Terasaki ramps in an organelle called the endoplasmic reticulum (ER), a network of membranes found throughout the cell and connected to and surrounding the cell nucleus. A team of researchers have described endoplasmic reticulum geometry using the language of theoretical physics in Physical Review Letters. The rough ER consists of a number of more or less regular stacks of evenly spaced connected sheets, a structure that reflects its function as the shop floor of protein synthesis within a cell. 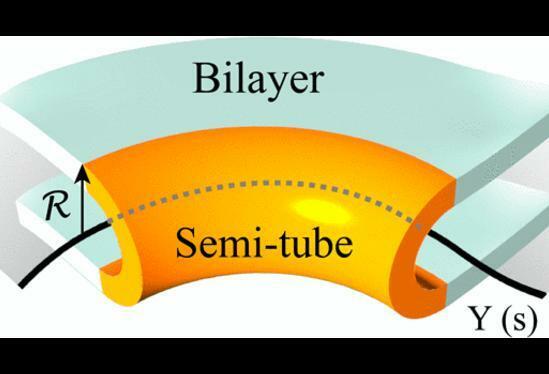 Until recently, scientists assumed that the connections between adjacent sheets were like wormholes — that is, simple tubes. Last year, however, it was discovered that these connections are formed by spiral ramps running up through the stack of sheets. According to lead author Jemal Guven of the Universidad Nacional Autónoma de México, this came as a surprise because spiral geometries had never previously been observed in biological membranes. "Our work hypothesizes how the particular shape of this organelle forms, based on the interactions between Terasaki ramps," said UC Santa Barbara biological physicist Greg Huber, deputy director of UCSB's Kavli Institute for Theoretical Physics. "A physicist would like to say there's a reason for the membrane's shape, that it's not just an accident. So by understanding better the physics responsible for the shape, one can start to think about other unsolved questions, including how its form relates to its function and, in the case of disease, to its dysfunction." Attached to the membrane, ribosomes, which serve as the primary site for protein synthesis, dot the ER like cars populating a densely packed parking structure. "The ribosomes have to be a certain distance apart because otherwise they can't synthesize proteins," Huber explained. "So how do you get as many ribosomes per unit volume as possible but not have them bump up against each other?" Huber asked. "The cell seems to have solved that problem by folding surfaces into layers that are nearly parallel to each other and allow a high density of ribosomes." Different parts of the ER have different shapes: a network of tubes, a sphere that bounds the nucleus or a set of parallel sheets like the levels of a parking garage. The smooth ER consists of a tubular network of membranes meeting at three-way junctions. These junctions are also the location of lipid (or membrane) synthesis. As new lipids are produced within the smooth ER, they accumulate in these junctions, eventually cleaving apart the tubes meeting there. In the rough ER, the parallel surfaces or stacks are connected by Terasaki spiral ramps. In some cases, one ramp is left-handed and the other right-handed — the parking-garage geometry — which is what Terasaki and colleagues (including Huber) found last year. "We propose that the essential building blocks within the stack are not individual spiral ramps but a 'parking garage' organized around two gently pitched ramps, one of which is the mirror image of the other — a dipole," said Guven, who was assisted in his research by one of his students, Dulce María Valencia. "This architecture minimizes energy and is consistent with the laminar structure of the stacks but is also stable." In physics, these helical structures, which connect one layer of the ER with the next, are called defects. That word, Huber noted, carries no negative connotation in this context. "When you look at this through the eyes of physics, there are certain mechanisms that suggest themselves almost immediately," Huber said. "The edge of an ER sheet is a region of high curvature because the sheet turns around and bends. The bend is actually the thing that's forming the helix." The bend creates a U shape that looks like half of a tube. 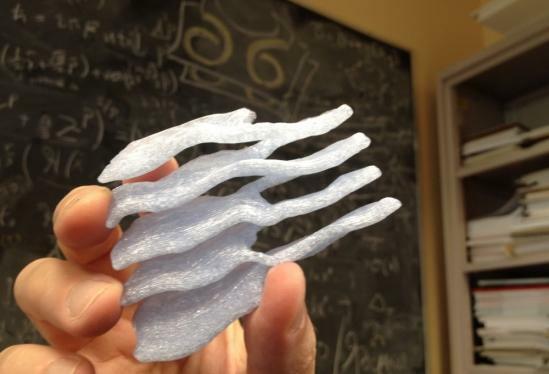 Huber and his colleagues applied the principles of differential geometry to this curved membrane. Pulling the halves of a tube apart creates a flat region spanning the two U-shaped halves, which then become part of a sheet. "The geometrical idea is that one can actually get a sheet by pulling apart a network of tubes in a certain way," Huber explained. "Imagine that each of the U-shaped edges wants to bend, but when you try to connect those two U shapes together, each one is now bent. That's what the color figure is trying to show. A tube can generate a sheet if the edges come apart and they're allowed to bend in space." According to Huber, this theoretical work provides a deeper story and richer vocabulary for discussing the shapes found in cell interiors. "One suspects that their shape is related to their function," he concluded. "In fact, scientists know that the shape of the ER can be an indicator of abnormal functions seen in certain diseases."